Yonezo Hoshino of Tamachi, Akasaka-ku, Tokyo, was a graduate from Sloane Flying School at Hempstead, Long Island, USA, in 1913 from which he earned international licence No.231. He returned to Japan in july of that year. With financial assistance from Kanzaburo Aijima, a member of the japanese Diet, he built his first and original design of a tractor biplane in a warehouse of the Yamashina Maritime Industry Co (Yamashina Kaiji Kogyo Kaisha) in Kobikimachi, Kyobashi-ku, Tokyo. In appearance it resembled an early Curtiss tractor biplane, having its ailerons mounted at mid-point on the wing struts. This single-seat aeroplane had a wing span of 12m (39ft 4 1/2in), was 7.90m (25ft 11in) long, and had an empty weight of 390kg (860lb). It had two mainwheels and a small one at the front of the skid provided to prevent nose-overs. For an engine, always the most critical factor in building an aeroplane, Hoshino borrowed a 50hp Gnome air-cooled rotary from his friend Tetsusaburo Tsuzuku, also a builder of aircraft. 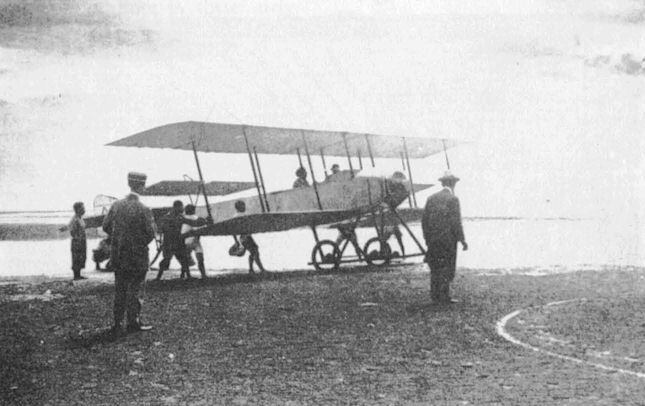 Completed in August 1914, Hoshino's aeroplane was first flown very successfully at Inage across the bay from Tokyo. During a later flight on 13 September of that year, he attempted a flight to Tokyo, but while flying in fog and having to stay very close to the surface to maintain visual contact around Tsukijima, his port wingtip hit a post that was standing in the water, and he was forced to make an emergency landing nearby on a muddy area of reclaimed land. This enforced landing damaged the nose and propeller of the aeroplane and Hoshino was injured. After the aeroplane was repaired, he redesignated it Hoshino No.2 Aeroplane, although only minor changes had been made. Beginning in October 1914, he took the aeroplane on an exhibition tour starting at Shizuoka and Gifu. Again, Hoshino sustained injuries and damaged his aeroplane when the engine failed on 31 October. With repairs made, undaunted he flew on to Hamamatsu, Maisaka and Hamanako, all on 30 November, and to Fukui on 10 to 12 December. By now, however, he was committed to return the borrowed engine to Tsuzuku who needed it to power an aeroplane ordered by the Chinese revolutionary army. Thus, without an engine, he was also without an aeroplane, so he assisted his friend Tetsusaburo Tsuzuku with the delivery of the Tsuzuku No.3 Aeroplane to Shantung in northeast China, and served as an instructor pilot. The Hoshino No.2 Aeroplane remained at Inage, was soon given a 70hp Gnome rotary engine and converted into a two-seat aircraft. It is known to have flown from the Tokyo Aoyama Parade Grounds on 22 September, 1916, in this configuration, but no further details are known.